PathFactory let B2B marketers tell complex stories to busy audiences simply & effectively. Work for PathFactory (formerly LookBookHQ)? 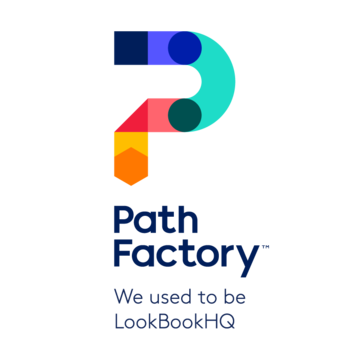 Learning about PathFactory (formerly LookBookHQ)? The product is user-friendly. It is easy to update content within the product and easy to customize the target track. Currently unable to update single content URL, for each new content, forced to create a Target Track to not Pathfactory's name in the URL. Would be great to have the flexibility to set own URL for separate content uploads. Be able to remove old users in the admin view, be able to create own unique URLs. The one benefit of Pathfactory is that content lives inside the platform, and no need for the user to have a separate cloud storage for the assets. The benefit of Pathfactory is the ability to see how often users view the assets, and what topics are more popular with the audience. If you're referring to something else, please let us know! The platform is the easiest app I've used to date. So intuitive, easy. Some bugs, but they're very responsive to feedback. So easy to add content and create experiences. They've thought of so many things with the settings. Huge improvement for our users to binge content - and see all the metrics of time spent, number of assets viewed, etc. Customer Success and Support teams are fantastic. Cory G, our Account Exec, was the best AE I've ever worked with. Wish the UI of the user-facing experiences was a little slicker and more modern. Iframing is pretty basic technology and full-page reload is too bad. Wish the UI in the platform of your list of Target or Recommend experiences was updated to make it easier to view/sort/search. Number one was moving away from the gated landing page (or worse, the ungated thank you page) experience. Second was being able to measure real engagement and learn from that data about what is most relevant content. Third was being able to increase MQL velocity by allowing people to engage more deeply when ready. Only 1 quarter in so don't have full metrics to report yet. But no doubt we will see incredible results. What Content Experience solution do you use? "Great tool for continued engagement and robust content analytics"
We're able to identify hot leads that have actually consumed our content and continued to binge other pieces. We can see stats like average view time, top content tracks, overall content interactions. We had a hard time integrating it with out attribution tool. Also, it's integration with Marketo is kind of rigid. It passes over values in brackets which breaks with our standard naming conventions. We've had much better visibility into people who are actively engaging with our content, vs people who visit a page and bounce. We're able to use the insights to optimize our content and make data driven decisions on what content converts best at different stages in the funnel. Thanks for your feedback, Caitlin! This week we've released updates to our Marketo integration that include additional data (such as IDs for content assets), which will make the integration more flexible and valuable for you. We have further plans to make all our integrations more flexible in the coming months. "Great company, great people, great product"
A lot of care and attention has gone into this product. PF have crafted a solution that is flexible and powerful. I've had numerous discussions with their technical and marketing teams and it's clear that they know what they are doing. We wanted a highly customizable content bingeing platform that integrates well with Marketo and SFDC, and PathFactory clearly beat out the competition. Honestly not much to say here. The product roadmap that they have shared seems to cover most of the areas we need, such as deeper analytics and UX improvements. Sit down with PathFactory and its competitors and ask them to log in and show how they are using their platform in their own marketing campaigns. The biggest problem that PathFactory is solving is the need for quality leads who are self-educated. Previously, we were sending massive quantity of leads to our salespeople, but the conversations weren't as productive due to unfamiliarity with our company and it's products. Now an SDR can see what content a lead has consumed in real time and engage with leads with more context. "Everything we hoped it would be..."
The content library is awesome! I love that we only have to input content one time and then that we can use it in all our LookBooks and (I think) see performance for that piece across all LookBooks! The 2.0 platform took some time to get used to but now that I am in it, I like it more. It's more robust and easier to use once you get into it. The new explore and website functionality looks promising and will help us take this tool from being a content amplification and demand gen tool to being something that can help all areas of our marketing department. Some features aren't intuitive, we've struggled to get off the ground with the explore and website functionality. I think these will be really helpful once we figure them out and get them on our site. It would be nice to be able to click on a content piece and expand it to full page rather than only updating it in the small side panel. Our company was struggling to drive engagement with our content. We worked really hard to drive people to our website and landing pages but struggled to get them to stay engaged and keep learning. I ran into LookBook and quickly got our team involved as something that might solve out issues. The team quickly got excited about the potential. About 6 months later we signed up and love the tool. We are seeing a HUGE increase in content consumption (binging) and its driving highly engaged leads into our funnel every day. "Never ever have to fill a form again"
Most annoying part for both end users and marketers is having to fill up all those lengthy forms to promote/access any asset. PathFactory does all the magic behind the scene and at the same time you can access more than 1 asset within a single page. At times end users fail to understand the concept of hosting multiple assets in the same URL and they skip after consuming the first asset in the page. PathFactory has changed the way we used to promote content and made it easier for us to generate more qualified leads at the same time improving the user experience. Hi Ankit, We appreciate the feedback! We carefully study visitor behaviour and are working on UX enhancements that will better orient first time visitors especially, while encouraging them to consume more content. "PathFactory excels at content analytics and empowering your content to drive leads down-funnel"
A few pain points with PathFactory have been managing our content track library, balancing visits to the pathfactory pages with visits to our web properties, and dealing with a few minor limitations regarding layout etc. Our primary use-case for PathFactory has been in our nurture programs, with some recent forays into prospecting. In the nurture programs, we have seen increased content consumption, which, when tied to our lead scoring model, has resulted in an accelerated lead journey down funnel. We appreciate the feedback. We'll be releasing our new Organization and Discovery features in a few days, which includes folders and labels for your content tracks! Our roadmap includes unifying traffic between content tracks and the website - we will keep you updated on those developments. And we'd love to hear more about your comments regarding the layout - please reach out to your Customer Success Manager and we can arrange a discussion with our product team. "Expansion in use of virtual events past the live date"
One of the things i appreciate the most coming from a virtual events standpoint is connecting people with related content to the topic of a virtual event, so they can consume content at their own pace. While meeting your customer where they are is critical to our business, collecting the insights and behavior of our different personas fuels continued growth in our organization. How complicated it is to load content in and how our content library isn't set up very well. Also that we can't use our ON24 webinar links in Pathfactory. The Pathfactory blocks the On24 API and visversa. Neither parties have taken steps to remedy the issue. It's quite frustrating. Thanks for your feedback! We're working on enhancements that will make the content upload easier, as well as improvements to the Content Library interface. The limitations with ON24 are due to a 3rd party framing restriction on their side; however we are actively engaged with them, with aim to build a custom integration in the new year. "The best asset delivery tool I've had to date"
It automates opening up the assets on a page together, regardless of the type, allowing the user to binge on all the content instead of taking extra clicks to find the next relevant piece. We use it in an overlay, which on mobile can make some PDFs hard to read. you need to determine whether the cost yearly is worth it depending on the volume of assets you need your customers and prospects to consume. You also need to have a strategy in place for the buying cycle and how your assets fit into that. The pages that the lookbooks spawn from, what assets should go on those pages. What assets should be used in a nurture program after the initial download, etc. If you don't have this in place, LBHQ will not magically solve anything. It eliminated the need to build a thank you page with the asset download for each item. Streamline in LBHQ, it takes 3-4 fields to create each item, and then you can share the same form between the assets in a LB. "LookBook has changed the way we deliver content"
We love the way you can control the content experience you are giving the user, and we especially like the detailed analytics on the back end. It has helped us fine-tune many campaigns -- chuck the stuff no one likes, and beef up the stuff they respond to. Some discrepancies in the way LookBook measures form fills compared to our system. Makes that data point hard to pin down. We are making it faster and more efficient to stand up promo page type experiences by simply building clever LookBooks. PPC campaigns can be tailored and launched a lot faster than before. "The Netflix of B2B content management solutions. " PathFactory is easy to use and the company is very innovative. They release product updates on a regular basis and they continue pushing the boundaries of "content binging". It's great that PathFactory is releasing new features on a regular basis, but if you don't have a dedicated resource on your team to truly learn the product, then it's easy to under utilize the tool. Although, we do have a great CSM who is always encouraging us to leverage different functionalities. We're able to let our prospects consume content at their own pace and in a fashion that makes sense to their own individual "buyers journey". Thanks for this feedback. We appreciate that there are a lot of features, which are constantly growing, and have recently used in-app guides and tooltips to help with this. You can expect to see more of this in the future to help you navigate! If I had to pick a single thing, I'd say simplicity. LookBook makes it easy for marketers to build interactive content experiences that produce and move leads through the funnel. This is a somewhat technical issue, but it would be great if users could transition content experiences down -- from intermediate to basic for example. LookBook is most useful to teams that have access to plenty of content OR the means to procure content. The platform is very easy to use. In addition to demand gen, the platform is also useful for partner marketing and enablement. We were interested in making it easier for prospects to consume content and move through the marketing funnel. LookBook has given us a platform for making marketing content more consumable. It is paying for itself by accelerating the lead nurturing process, so that prospects reach MQL status faster -- more than 2x that of leads generated by stand-alone assets. They have some great things coming up on their roadmap that will help using the platform be even easier. Luckily we're not in this position, but if your website is controlled outside of Marketing and you want to get landing pages, reg pages, or microsites up fast, you can do it with LookBook. You can also use forms right out of your MAP so data is passed right over. When we were rolling out our new topical email drip campaign strategy, we came across LookBookHQ and noticed that it complemented the initiative very well. We took the content that was already running in our campaigns and created LookBook content experiences with it. We started using the intelligence around the content they consumed in LookBook to move them around the drip program in a more meaningful way. By using LookBook, we also started creating complementary pieces of content. Previously we'd create an eBook and maybe write a blog about it after posting it on our website. Now we're shifting to a model of creating an infographic, video, whitepaper and multiple blog posts to support that anchor asset. LookBook is really showing us the importance and effectiveness of this. "LookBook is a fantastic tool for expanding your content reach." LookBook is easy to use both for the marketer creating the content experience and for the actual viewer on the other end. The seamless process from concept, to posting, to presentation makes it simple and straightforward to expand content experiences across a multitude of mediums including email and web. The most difficulty we have had with the tool has been around managing content URLs and keeping track of the significant number of LookBooks we have. This will become a non-issue when they roll out their content library for general use - it is currently only available in the Recommend tool. When you're considering the tool, make sure your demand gen teams buy in. We have had success with the tool because our teams have been willing to use it for a multitude of emails and web programs. Tracking is another consideration. We didn't enter with a strong plan in this regard, which has made things more difficult for us. When you begin deployment, make sure you have a way to track your assets effectively across different LookBook content experiences. LookBook provides the asset views as website view activity into Marketo (our marketing automtaion software), which we then use the attribute specific assets to specific SFDC campaigns across different LookBooks. The core problem we are solving is that it is difficult to capitalize effectively on clicks on our website and in email. LookBook has allowed us to present prospects/customers/partners with content that is related to what they are looking at in a simple, engaging experience. Further, it also allows us to track activity across assets, including view duration. "Above and Beyond in Customer Experience Delivery"
I love the analytics in regards to the buyer behavior. Analytics can defnitely use an enhancement when it comes to reporting on content engagement across all lookbooks. We struggled to show the value of content consumption with our senior leadership. They wanted to know about email engagement because that is all they knew. LookBookHQ opened a whole new world where we could speak about the customer journey and how people are progressing through the buyer stages. We also finally had a platform that gave us content consumption time. It is one thing to say to a sales leader, "...we know this person viewed a white paper on <X> topic," but it is a whole other thing to break down the entire journey and say the time that person spent with your content. Thanks for sharing your thoughts, Brandi! We're so happy you're getting a lot out of the analytics in LookBookHQ. In the very near future we're releasing an enhanced analytics dashboard that will give you a more holistic view of how your content experiences are performing. "Easy to use platform with great results." I love the fact that you can combine different pieces of content into one experience for users. This allows for a variety of uses from eblasts, social media platforms, and so much more. I wish that there was more customization involved in LB. Possibly more variety in the ways that you can showcase it to customers. It's a great product that can really help engage your consumers with a variety of content all in one place. Trying to get consumers to look at more content thus creating more leads. It really helps engage our consumers in content that they might not have looked at had we sent them just one link with a dead end. It takes just minutes to add content and create a content experience using LBHQ. We've seen that additional content added to each program has generated a 32% increase in views. Previously that number was 0% as we only tracked the download of a PDF. The company offers service and support that makes our purchase worth every penny. We're very happy we've chosen to give the platform a try. The organization of the content experiences are a bit clunky. We have a lot of experiences in there, sometimes it's hard to find the one we're looking for. Also, the mobile version of a content experience could really use some work. It's not completely mobile friendly, and a lot of our social campaigns drive people to a LBHQ experience, so it's important that it's easy to view on a mobile device. We'd like to do a better job with scoring, and find this will be possible using LBHQ. It's also easier to create forms and integrate them into our LBHQ experiences, instead of gating content using Marketo landing pages. "Do more with the moment. Simply"
The platform, the team, the problem it solves....honestly I don't know here to start. LookbookHQ and the content experiences it delivers is just the perfect fit for a rocking nurturing campaign. So far I can't say i've been disappointed by LookbookHQ so far. When someone decides to engage with you by clicking on your email, this is a big sign he or she is sending back. A "sign" saying , now is the moment. the moment i'm ready to consume your content, give you attention. By using lookbook we optimize this "window" given by the contact, by offering more in the same experience. "LookbookHQ makes it easy to create content journeys." Ease of use. I like being able to create Lookbooks is less than an hour. I dislike the the use of topics. I have difficulty tagging assets by topic. LookbookHQ makes it easy for Marketers to create landing pages. If you have to go through a lot of hoops to create landing pages, then you would like this platform. Content drips to various stages of the sales funnel. "A system of record for content marketers"
A content marketer's dream - Lookbook allows you to get deep data from your content and furthermore, use that data to make intelligent decisions behind the scenes. It is still a young tool - so there are certain things that don't scale well. The roadmap is good, however, and the customer success team goes above and beyond to compensate for any scalability issues. Start small - there's a lot you can do but set specific goals and milestones, rather than trying to achieve it all at once. We can now use our content much more effectively, and leverage better data to identify and nurture leads that have a higher propensity to close. No more assuming that content is being read or absorbed, and no more 1:1 ratio of click-to-content. Lookbook allows us to better engage and track our prospects throughout the funnel. They desparately need to enable folders! My team's instance of lookbook is cluttered now and it's too hard to quickly grok which key topic areas we have which lookbooks for, which GEO are using them etc. Ability to scale customized experienced across a global marketing team. Modernize our approach from 1 email - 1 CTA to a more robust user focused experience. "LookBook—an exciting way to present content." I like that LookBook has a couple different options for how you can display the content, plus so many different options for transitions, callouts, forms, etc. I dislike the fact that SEO doesn't really seem to come into play with LookBook. Are search engines really able to crawl any info. from LookBook? We are trying to make content flow from one piece to the next, as well as getting readers to dive further into a string of content pieces rather than read one and be done with it. Lauren and Tarek have been incredibly helpful in teaching me what I need to know and are quick to reply to my emails, love that! I wasn't a fan that they didn't have a better way to organize content, but they just released foldering, woo! PathFactory allows us to really customize content to the variety of audiences we're trying to serve and it allows us to do it quickly. We're so happy you're so happy about Foldering! "PathFactory helps you accurately analyze viewer participation and gauge visitors' true habits." I like that PathFactory allows you to obtain more insight into your readers habits. By viewing binge rates with specific visitor and visitor engagement information, you can see who is truly engaged with your content. The unique ability to see how long (in seconds) each visitor is in an asset is amazing for our marketing purposes. In order to fully digest the analytics, I wish pathfactory came with preset and formatted reports that you could then tailor by adding or removing fields, as needed. Allows us to rank our client engagement and assign more accurate engagement lead scores, resulting in more efficient and accurate targeting. Thanks for this feedback. We currently have a lot of reports powered by a massive dataset, and plan to make Analytics more flexible for data analysis and exporting. We will keep you posted on developments! "Super easy to use - great customer support"
I write all the content I add to PathFactory, and using this tool is a welcome break from that part of my job. We recently released enhancements to various Analytics reports, as well as a couple of Analytics products in beta. We would love to hear if you would like to be included in the beta programs - please email your CSM to learn more! "Great Tool and Exceptional Customer Service"
I'm most impressed with the level of engagement with LBHQ and our staff. Our CSM is always reaching out, helping us decipher the best ways to implement the tool on our website and proactively providing us with insights to leverage the tool further. My only dislike is the cost associated with the tool - it's not necessarily a cheap and cheerful. We were noticing that there was some stagnation in pushing leads along from the middle of the funnel to making a decision to purchase. By implementing our content journeys via LBHQ we enabled our customers to find out/learn more specifics about products and solutions to expedite time in the buying journey. "Lookbook: Enabling Great Content Experiences"
Lookbook offers the ability to arrange our content in a targeted way so that consumers of our content have a good way to consume everything they want to consume. Currently no way to save content on the platform, have to re-create each content whenever a new content experience is created. Lookbook allows us to get more content in front of our prospects at one time, instead of counting on multiple campaigns and multiple touches. Thanks so much for your review, Dan! Good news: We have a major release coming soon, in which you'll see the addition of a Content Library! This is where all the links to your content assets can live, so you can add them to new experiences. My favorite part about LookBook is that it is easy to use, and it helps create a "story" that's intuitive for your customers to follow. I would like to see more customization features added. I think it's a great tool to use for more traffic to your website. Leading more potential customers to our website creating more traffic, and more opportunities. The account team has done a great job helping us implement LookBook and build out the Marketo smart campaigns. The data from LookBook doesn't sync in real time making it hard to build trigger smart campaigns based on views. We're trying to increase engagement with content. We're able to see how content performs relative to other content because we're able to create LookBooks with a number of content pieces together. Thanks so much for your review, Mabel! We're pleased to let you know that the data syncing is being addressed in an upcoming product release. Please stay tuned for more information soon from our team! Easy to create content, awesome reporting, really responsive customer success team. Some of our content was blocked (portals, blogs) which prevented us from fully using the application. If you have lots of content and want to increase usage of it, definitely give LookBook a try. You'll be able to see quickly how valuable each piece of content is and how customers consume it. Looking to increase/accelerate content consumption. Thanks for this feedback. A majority of our customers use 3rd party forms within their PathFactory Content Tracks. PathFactory renders these forms in their original state and preserves the look and feel. Our out-of-the-box forms have some branding and customization features; however we'd love to hear more about your specific use case and needs. Please feel free to reach out to your CSM so we can continue the conversation. "Renovated content experience with LookBookHQ"
Real time nurturing: feeding relevant content to people while they are viewing something they are interested in. Marketo integration could be simpler, but it's pretty good as is. I don't know how we did without it. Real time lead nurturing, persona content journeys, helps with lead scoring and prioritizing. The customer experience is great! Easy to browse the promotions. User experience could be better. It's a lot back and forth to build an email/content. Solving Customer experience of our communication. Benefits are the articles - shows in a good way! "Update would make easier to use"
The filter and search tools at the top of the screen are useful. Screen view when first log in and the navigation tools could be improved. Detailed reporting for specific campaigns. "Great tool. Expanding metrics and functionality. Very helpful team interested in customer success"
Patnership style of customer relationship. Historic records limited to 90 days. It would help to have the ability to compare earlier material performance with current/new deployments. Intuitive tool. Great and fast content management for all marketers on the go. Great product support. I would love to have more control on appearance settings. Analyzing web experiences based on web interactions. It is easy to navigate on the renewed platform and it is very user friendly. Form integration / form popup settings should be easier. "LookBook HQ Helps You Tell Your Story"
The multi dimensional experience of the photos and layers of information and how they weave together to show a very polished professional and multifaceted story of what your presenting. Whether a blog, a company snapshot, a newsletter or a marketing proposal, LookBook HQ makes makes it look amazing. It was sometimes tricky to figure out how to interface with websites. Using it for Blogs, newsletters and marketing proposals. I think it should with Salesforce for better reporting and dashboard. Great place for content management and tracks consumer. Feature seems pretty easy to use yourself. I would say if you are able to go off on your own and not through corporate you will be able to go far and learn how to create your own lookbook pages. Longer time on the actual webpages. LookBookHQ allows us to easily create content experiences to allow our prospects to engage with the content that's relevant to them. I don't have any complaints. If I ever have an issue the LookBookHQ team is super responsive and always willing to help out. It's really allowed us to dive into the customer journey and get insights into what assets are working and what isn't. "LookbookHQ is a platform to accelerate lead flow"
The personalized customer service I receive from my LookBook HQ reps. Some functionality with the LookBook HQ app could be improved. Trying to increase engagement with demand generation content. It's nice to have the viewers be pushed along in the buyer's journey by LB's suggested content. "Great tool to track interactions and track prospects"
I like the way how it tracks potential and most performing prospects. It helped us to focus on what matters most. Helped us to understand how the engaging process looks like in a real life and how to turn prospects into clients. "Great resource for my campaigns "
"Great tool to engage leads with your content. " The ability to serve up content to leads and keep them engaged. There is nothing that I dislike with LookBook. This had helped nurture leads on different buying journeys easily. * We monitor all PathFactory (formerly LookBookHQ) reviews to prevent fraudulent reviews and keep review quality high. We do not post reviews by company employees or direct competitors. Validated reviews require the user to submit a screenshot of the product containing their user ID, in order to verify a user is an actual user of the product. Hi there! Are you looking to implement a solution like PathFactory (formerly LookBookHQ)?